Shredded green and red cabbage, carrots, chopped scallions, toasted sesame seeds, and pineapple tidbits tossed with a zingy low-fat bottled Asian vinaigrette. 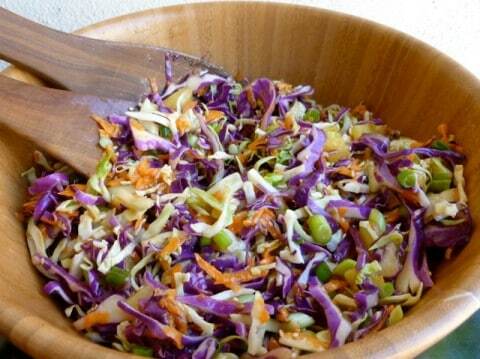 To keep this low-fat Asian slaw super quick and easy, I used already shredded red & green cabbage mix. This Fast Asian Slaw Recipe from The Dinner Doctor cookbook popped into my head as I was trying to come up with another easy salad or side dish to go with our completely non-traditional Memorial Day dinner of baked ham, potato salad, and Mom’s broccoli casserole. I thought “coleslaw,” but didn’t want a creamy one. Don’t get me wrong, I love creamy coleslaw, but it would have been too much mayonnaise on the menu, since we already had it going on in the potato salad and broccoli casserole. 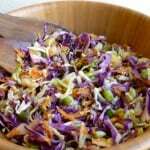 Using pre-shredded coleslaw mix and bottled Asian vinaigrette (I like Newman’s Own Lighten Up! Low Fat Sesame Ginger Dressing with only 35 calories and 1.5 g fat in a 2 tablespoons serving) saves a ton of time too. To toast the sesame seeds, place them in a heavy skillet over medium heat and stir them until the begin to darken slightly, 2 to 3 minutes. Then remove them from the pan immediately so they don’t burn. According to my calculations each serving has 72 calories, *2 Weight Watchers PointsPlus and *3 Weight Watchers SmartPoints. If you’ve made this Asian Slaw with Pineapple, please give the recipe a star rating below and leave a comment letting me know how you liked it. A quick & easy recipe for an Asian-inspired cabbage slaw that makes a great side dish for grilled or roasted chicken, fish or pork. Place the coleslaw mix, scallions, drained pineapple tidbits, and sesame seeds in a large bowl. Drizzle the dressing over the mixture and toss to combine well. Serve the slaw right away, or cover and refrigerate for up to 3 days. The volume of each serving will depend on how long this slaw sits, as it will get more compact with time.